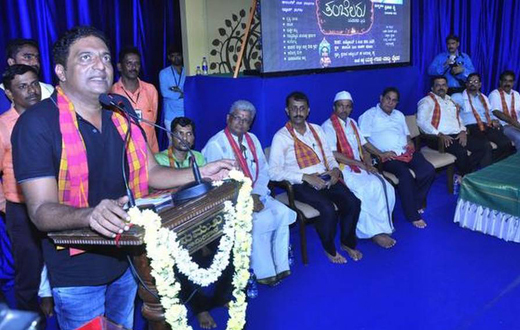 Udupi, Oct 11, 2017: Actor Prakash Raj (Rai) was honoured with ’Shivarama Karanth Huttura Prashasti’ Award on Tuesday, October 10, in Udupi, despite facing opposition from the Bharatiya Janata Party and right-wing groups. Replying to questions from reporters after receiving the award at the Kota Shivaram Karanth Theme Park, Mr. Raj said there was a systematic pattern being followed to frighten people by trolling them and focussing on their personal lives. The intention is to make those who question feel lonely, he said. “I will not be cowed by such attempts. The people of the State, including writers, littérateurs and the awards committee, stood steadfast in their decision, just like the late Shivaram Karanth, of carrying on with the award presentation. This is not a question of who won and who lost. I am delighted to receive the award,” he said. 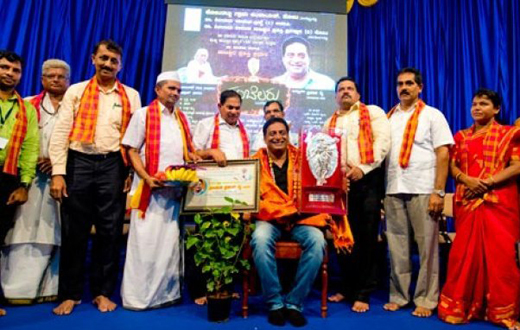 He said that despite the opposition, he received the award respecting the sentiments of fans of Shivarama Karanth. “There is a planned plot to create fear which is dangerous. Isn’t there freedom of speech? Words should be countered with words, not with murder and violence. Isn’t an effort to stop somebody from speaking equal to violence? What is the mistake in speaking out? I speak for myself,” Raj said. He declined to react to the BJP’s protest saying, “To protest is their right. Karanth too had said this. It is not important who had won or lost. The award had to be conferred and it has been done. This is a moment of defeat for those trying to curb freedom of expression. Targeting me on personal issues will not work. Like Karanth, I will not withdraw from my decisions,” he said.